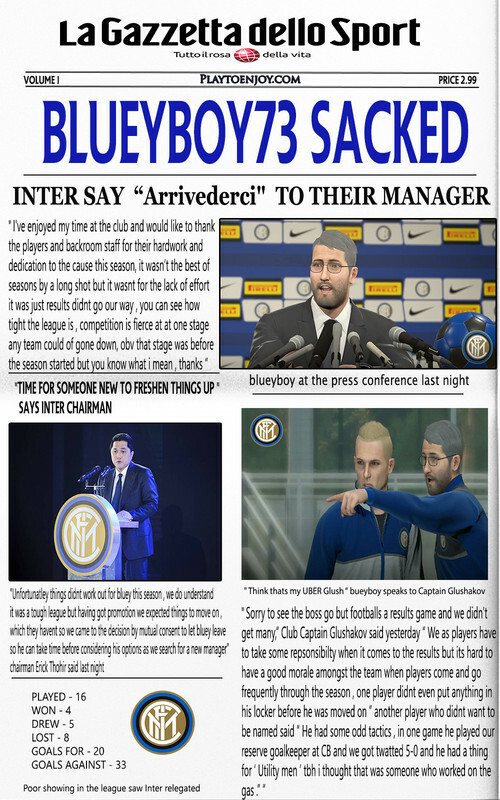 Italian giants Inter Milan saw fit to sack manager blueyboy73 last night after relegation from the top flight of P2E PS4 Football, he'd been in charge for 2 seasons . It had been a tough one for the promoted side , playing against top quality opponents although the effort was there , there was always something lacking and thats down to the manager.
" 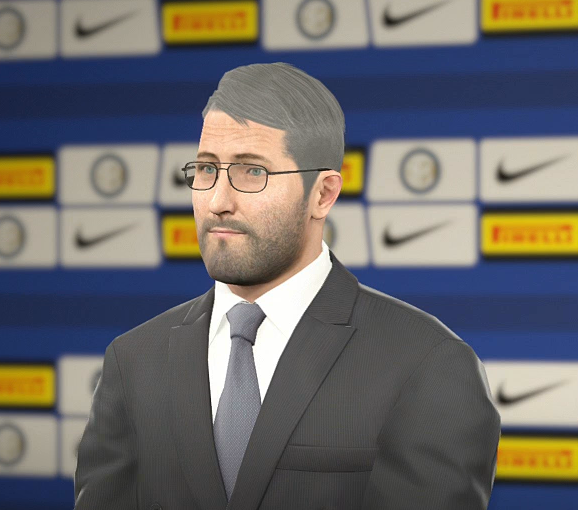 It was tough" bluey said this morning " i tried several formations and tactics through the season to try and compensate against established Premier teams and although we run a few of them close close doesn't get you the points, schoolboy errors and poor finishing are costly in this division and the table doesn't lie".
" I have nothing but praise for the fans this season as they got behind the team every game , and its a shame we didn't perform better to give them the results they deserved , but alas we were lacking and being the manager i have to take responsibility for that , i still feel i could of done a job here but the board have made their decision so im taking a break for a bit , ive already had a couple of offers in my inbox which ill mull over in the coming weeks and ill make a decision on my future then , thank you "
" Lack of tactical nouse " thats the verdict of Inter supporters club Chairman Mario Ferrari " The manager seem to just stick to the same thing week in week out , never changed to counter the quality of opposition , it was such a defensive attitude and if you look at his formations this season , where was the spark, the attacking options take a look at these , they were the 2 most common formations used this season "
Mario went on to say " there was no fluidity in the team it was rigid, some say boring , dont get me wrong Italian's love a bit of defensive football, but this was shocking the gap between the midfield , well i say gap it was more like a chasm , and the forwards meant resorting to long balls that were easily cut out " " But a bit more luck and Bluey may of still been in a job but you have to make your own luck. But when your conceding goals like this you know your luck has run out ( against @Don Raphael 007 ) "
"Not to mention the comedy selection of a back up GK at CB v @Petmaister which resulted in our worse loss of the season , i can only put it down to a lack of training and lack of experience that caused this, that and the high turn over or personal this season, what was it something like over 200 deals involving ins and outs in the last 2 seasons, thats crazy but its done now , thankfully we can start afresh with a new man but we do wish blueyboy well in the future "
Young players such as D. ZAKARIA A. LOOKMAN H. ONYEKURU and ZAMBO ANGUISSA will all be free agents next week and none have penned new contracts yet , this all points to a mass exodus from Inter before next season starts . i was sick of pasta anyway "